Many of the world's greatest authors and writers have called London their home. This is why we created the London Literary Pub Crawl. We love the area, but we are perhaps a little biased. So we asked travel writer Kevin Palin to write a blog for first time writer visitors to London. He's not seen our show, so we're rather glad he included The Newmans, the Marquis of Granby and, of course, our home, the Fitzroy Tavern. London is the setting for many great works of literature. If you are an aspiring writer, looking for a little inspiration then what better place to visit than London? As a writer, we understand that you may be on a tighter budget, which is why we have put together this budget-friendly guide for your first trip to the big city. The Newman Arms was George Orwell’s favourite pub. London is certainly not a cheap city to stay in, so if you are on a really tight budget, your best bet may be to book a room in a hostel. Some hostels offer private rooms, whereas others offer shared. There are hostels all over London so you shouldn’t find it too difficult to get a room. We have seen prices for as little as £10.00 a night for a shared room. If you are planning on staying in a hostel, always read the reviews first. Some hostels are better than others, so try and do a little research before making your booking. When it comes to hotels in London, most of them are pretty expensive. You may find that you can get a cheap deal using a website offering last minute bookings. Again, make sure you do a little research so you can get an idea of whether the price justifies the quality of the service. If you find that you can afford to spend a little more on a hotel, we would highly recommend Hazlitt’s which is located just off Soho Square. This hotel was once the home of essayist and biographer William Hazlitt and is extremely popular with writers today. There you will find a sitting room with a fabulous literary collection that houses many signed copies of books left by visiting authors. Although rates can be a little pricey, they do regularly have offers on, especially in quiet months like January. 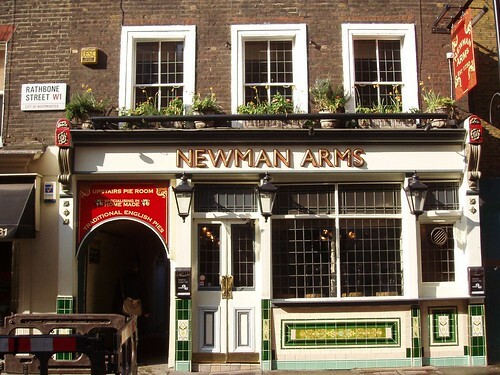 The Newman Arms in Fitzrovia is one of the best places an aspiring writer can go to enjoy a pie and a pint. This particular pub was said to be a favourite of both George Orwell and Dylan Thomas. It is the only family run establishment in Fitzrovia and specialises in serving home-baked pies made with seasonal ingredients. The Marquis of Granby is also another fantastic pub that we highly recommend to writers due to its association with T.S. Elliot. The pub is known for its hearty, classic British dishes and fine selection of cask ales. It boasts heaps of character and a welcoming atmosphere. The Fitzroy Tavern in Central London has had many famous literary visitors over the years, including Charles Dickens, Virginia Woolf, Dylan Thomas and George Orwell. The establishment was originally a coffee house, before it was turned into a pub in 1883. Downstairs you will find the writer’s bar which has a lively yet relaxed atmosphere. On the menu you will find traditional pub food at purse friendly prices. The Treasure of the British Library exhibition is free to browse. 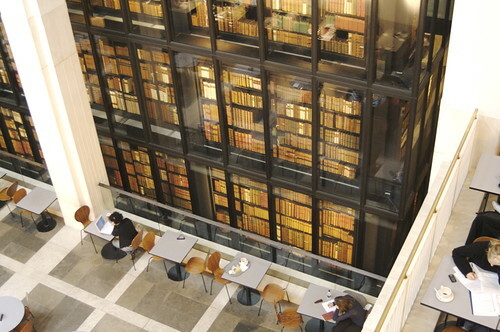 One of the best free attractions for lovers of the literary is the Treasure of the British Library exhibition at the British Library. There you will find a permanent collection of literary works from the likes of Shakespeare, Yeats, Wordsworth, Charlotte Bronte, Virginia Woolf and Lewis Carroll. If you are looking for another budget friendly attraction, we highly recommend visiting Keats’ House. The beautiful setting is said to have inspired some of his most famous poems including ‘Ode to a Nightingale.’ Inside the house you will find a collection of Keats’ original material, including some of his letters and poetry. Throughout the year organisers regularly put on workshops and tours, so be sure to check those out if you happen to be in London at the time. The entrance fee costs just five pounds. Another great place to visit is Dr Johnson’s three hundred year old townhouse. Dr Samuel Johnson lived in the townhouse during the 18th Century and it is the place where he created the Dictionary of the English Language. The house is open to the public and costs just five pounds for a ticket. Once inside, be sure to visit the research library where you can find some of Dr Johnson’s original work. Lectures, talks and exhibitions also take place throughout the year. If you have a little more money to spend on attractions, we highly recommend visiting Shakespeare’s Globe which is situated on the South Bank of the Thames, next to the Tate Modern. The tour costs £13.50 and is a great experience for all aspiring writers. Although the original theatre was demolished in 1644, it was rebuilt and kept faithful to its historic origins. Although the tour is a little pricey, you can watch plays for as cheap as £5.00 for a standing ticket. There are also regular events taking place at the Globe including sonnet walks and talks from various visiting authors and playwrights. So there we have it, our budget-friendly guide for an aspiring writer or literary lover’s first trip to London! We hope you have a fantastic time and enjoy all the city has to offer.